FREE VALUATION. To buy, auction, sell or consign your Lord Stanley of Preston autograph that is for sale, please email Nate@NateDSanders.com or call the Nate D. Sanders Auction House (http://www.NateDSanders.com) office at (310) 440-2982. Lord Stanley of Preston was born into English nobility and was the son of Prime Minister Edward Smith-Stanley. He served in the House of Commons of Canada and later as governor general of Canada. Stanley became an ice hockey fan after seeing a game at the 1889 Montreal Winter Carnival. He later donated an extravagant trophy to the Canadian Amateur Hockey Association to be awarded to the winner of the series. The Stanley cup has been presented by the National Hockey League since 1926, however the original trophy from Lord Stanley was retired in 1962. Signature of Frederick Arthur Stanley, known as Lord Stanley of Preston, originator of hockey’s Stanley Cup. After his appointment by Queen Victoria in 1888 as Governor General of Canada, Stanley and his family became avid hockey fans. His two sons played for an Ottawa team and persuaded their father to donate a trophy. In March 1892, the date of this signature, Lord Stanley sent a message to the victorious Ottawa club reading in part: “…I am willing to give a cup which shall be held from year to year by the winning team.” Soon after this, he donated a silver punch bowl to serve as a trophy for the best amateur hockey club. 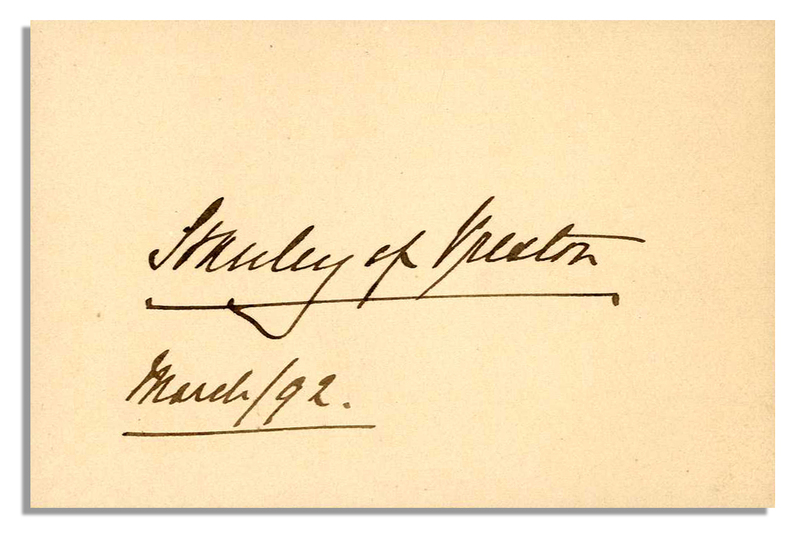 Stanley signs on a 3.75″ x 2.25″ card: “Stanley of Preston / March/92”. Minor toning and glue residue, else very good. Sold for $1,556. Lord Stanley of Preston Autograph. Click to enlarge. Appraise Lord Stanley of Preston autograph. Auction Lord Stanley of Preston autograph. Sell Lord Stanley of Preston autograph.